The Sony SLT-Alpha 37 entry-level APS-C replaces the Sony SLT-A35 in Sony's product line, but its design is very comparable to the Sony A33. 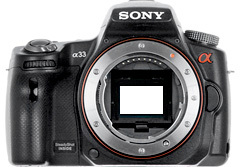 Just like its predecessor and its bigger brother the Sony SLT A57, the A37 is based on Sony's semi transparent mirror system. Sony unveiled its 2012 line and introduced the Sony SLT-A57, an updated version of its first digital SLR camera with a video viewfinder and EVF, the SLT-A55. The EOS 1100D (Rebel T3) replaces the EOS 1000 as Canon’s entry-level body. It combines a 12-megapixel sensor, Canon’s 9-point AF engine coupled to the 63-zone metering system introduced by the EOS7D, and of course the now-standard Digic 4 image processor. Taken individually, none of these features is really new, but the combination of all these solid elements should prove interesting. Moreover, the EOS 1100D is now gifted with a video recording function… but only 720p, which could be a limitation compared to what competitors propose for a similar price point.